Hi everyone, I'm taking the rest of the summer off from Plannerisms while my kids are out of school. The WeekDate 2014-2015 Academic planners are now shipping! Huge thanks to WeekDate for sending me this planner to review! I LOVE the color. This cover style is called "Rise And Shine" and is in Radiant Orchid, which is the Pantone Color of the Year. Gorgeous!! There are several other cover styles and colors to choose from including black "No App For That," peach with white dots "Pop Up" and turquoise and white "What Goes Around." You can see all the cover styles on their ordering page (click here). The planners have a sturdy coil binding, and a clear plastic cover front and back to keep your planner protected all year. The book measures 8 1/2 inches tall and almost 6 1/2 inches wide (including the spiral binding). It is super slim and extremely light (only 180 g/ 6.4 ounces!) so it can easily go everywhere with you in your bag. 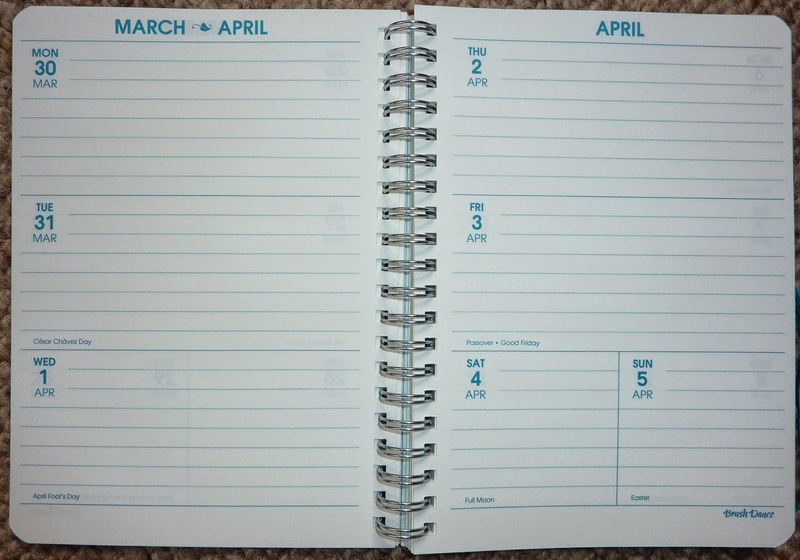 The WeekDate Academic planners have a unique format which allows you to write recurring events only once, and still be able to see them every week. Then if a scheduled event changes, you change it once and you're done! No rewriting, ever! You can see exactly how it works in their excellent video here. 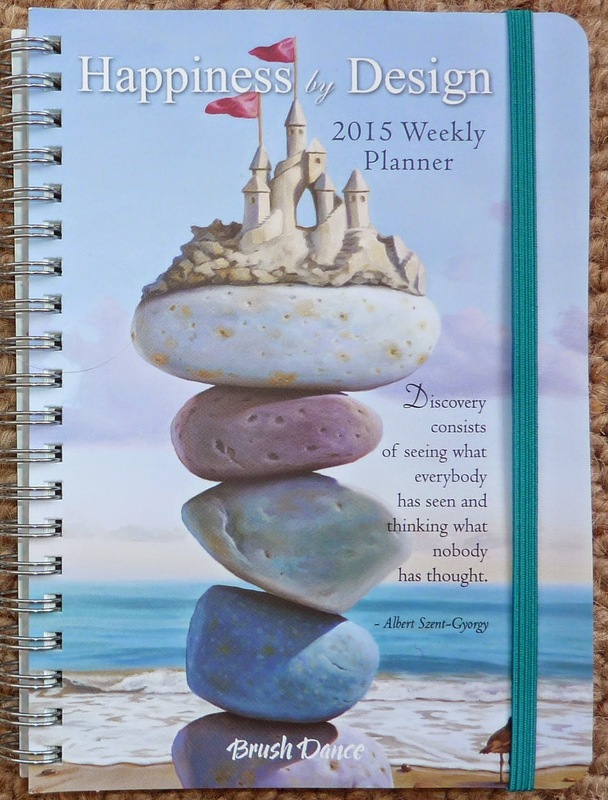 This planner starts the first of August 2014 and goes all the way through September 6, 2015. This academic-year format is great for students, or parents of kids in school so you can plan the entire school year in one book. Below you can see the WeekDate Academic planner open. The weekly layout has all seven days as full size vertical columns, with a column for lists and notes. Below the weekly pages is the area where you write recurring events. When you turn the weekly pages, the area below stays visible all the time. You can write class and afterschool schedules, carpool, work meetings, household routines, and anything else you don't want to forget every week. To the far right is a fold-out area for permanent information for quick reference. Or you can put sticky notes here for your task lists and any other temporary information you need to keep visible. This flap folds in to mark your current week. It has a handy calendar for the 2014-2015 academic year. Below is a closer look at the weekly format. US holidays are printed on the day spaces. You write your recurring events in the spaces below, then each day you look up and down the column to see everything you need to do each day. Genius! 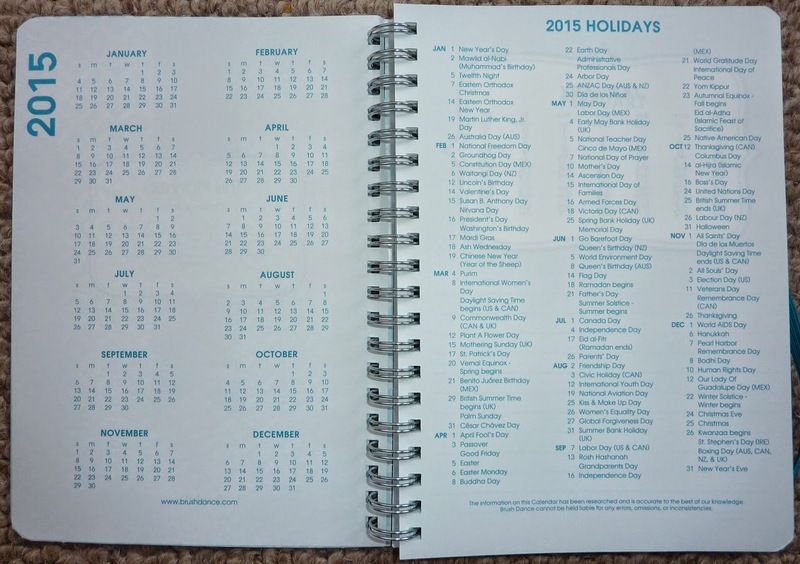 In the back of the book are monthly calendars for August 2014 through September 2015, with US holidays printed in the day spaces. There are also several pages for notes. This hugely convenient format simplifies the whole scheduling situation. No more double-booking weeks ahead because you haven't recopied all your weekly events that far in the future yet. No more changing events week after week because a time or day changed. You write everything once, and you're done! WeekDate also makes January-December planners (in a slightly different format), dry-erase wall planners, and more, click here to see their entire product selection. You can see more at www.WeekDate.com. 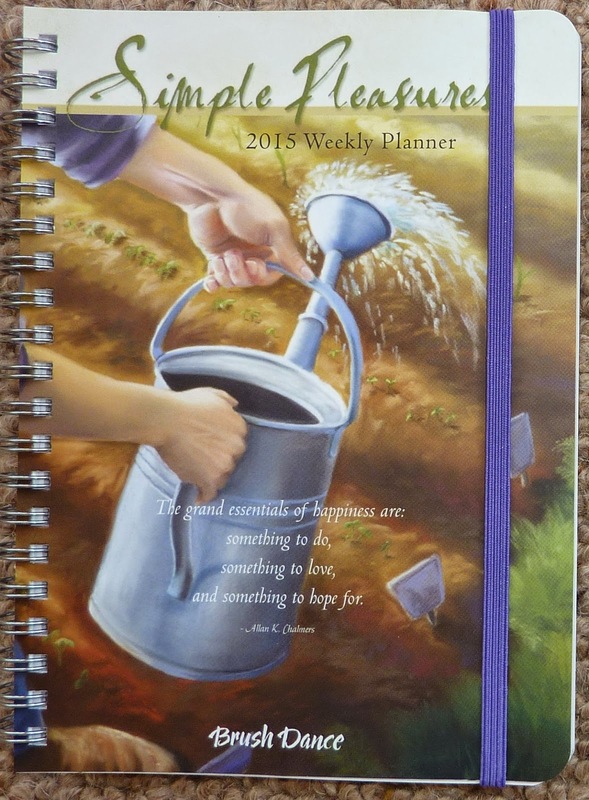 Thanks again to WeekDate for giving me the opportunity to review this awesome planner! If you're looking for a wall calendar, check out the Brush Dance wall calendars. They are absolutely gorgeous! 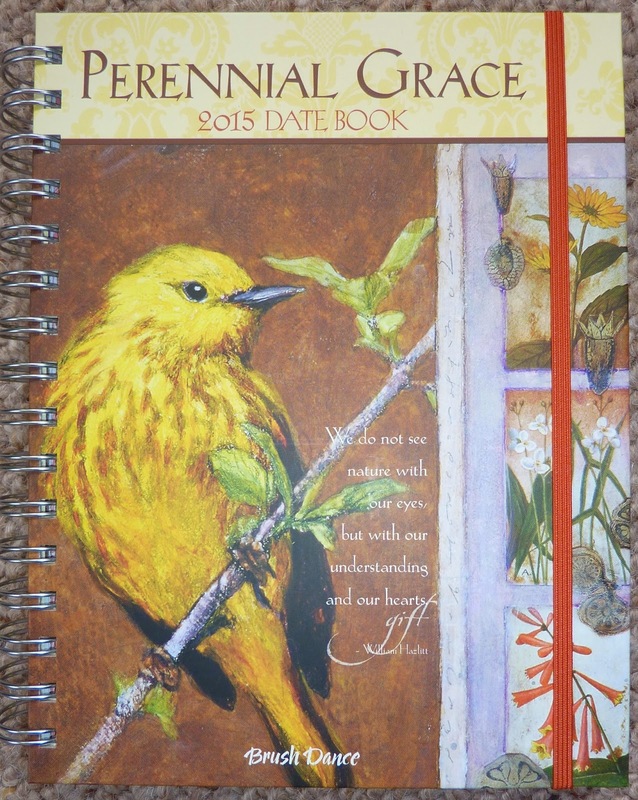 They recently sent me two to review, the 2015 Hummingbirds calendar and 2015 Live With Intention calendar. Wow!! Each calendar measures 12 inches square closed, so when it's open it's nice and big with loads of writing space in the day squares. Each month has a beautiful image and inspiring quote. The weeks begin on Sunday as is the most popular format in the US. Moon phases and holidays for the US, Mexico, Canada, UK, Australia and New Zealand are printed in the day spaces. Below is the June page in the Live With Intention calendar. The multimedia art is beautiful and the quotes are positive and uplifting. In the front of the Live With Intention calendar is a page about the author Renee Locks, her experience with painting and calligraphy, and what inspires her art. Very interesting! There are loads of themes to choose from in the Brush Dance wall calendar selection, you are sure to find one (or more!) that you love. There are also smaller versions of their wall calendars, check out their selection. You can find the entire range of beautiful Brush Dance calendars, weekly planners and datebooks at www.BrushDance.com. Huge thanks again to Brush Dance for sending me these calendars to review! I love Brush Dance Datebooks. I have reviewed them several times, cut the pages out to put them into my binder, and generally find them to be inspirational and beautiful. 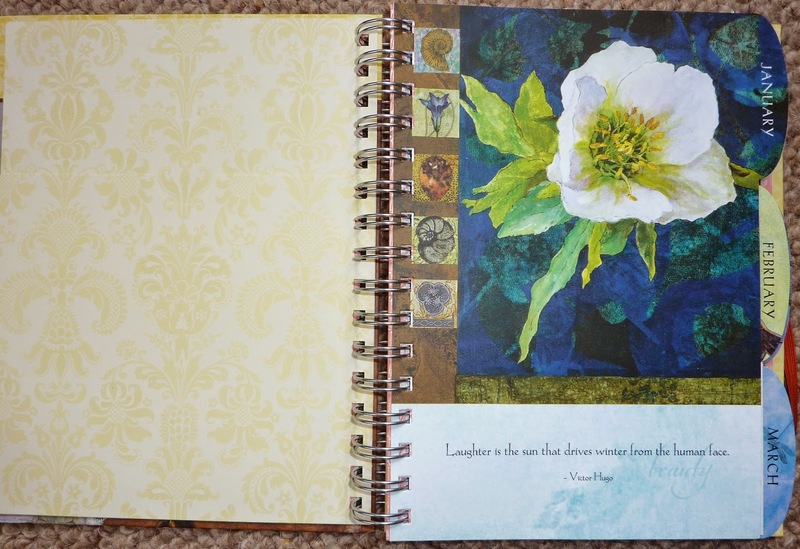 The Perennial Grace datebooks are probably my favorite because of the nature-themed art and quotes. 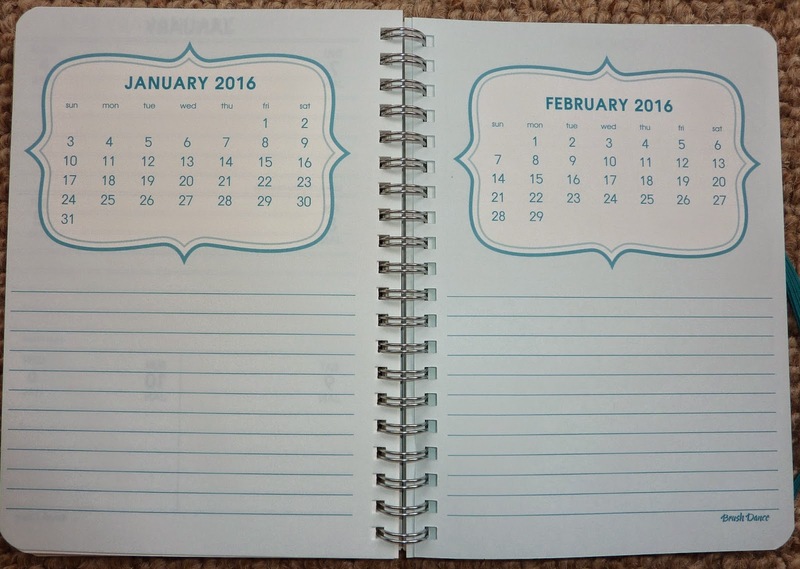 The datebooks are approximately A5 in size with a spiral lay-flat binding. The paper is amazing, it's super-thick so you can use your favorite pens (even fountain pens). There is a pocket to hold papers, and tabbed months throughout the book. Each monthly page has beautiful art and inspirational quotes. There are monthly calendars and a week per page layout. 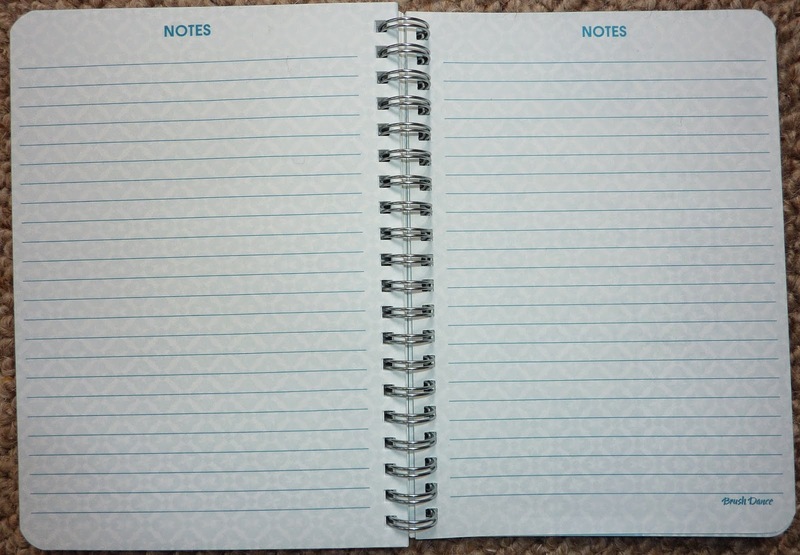 At the end of each month there are several pages for notes. In previous years there was a tabbed section at the back of the book for addresses, but the 2015's have a Notes section instead, which I prefer because I like extra notes pages and don't need address pages in my planner. There are 12 pages (6 leaves) of notes pages in this section. This means you can use a notes page per month, or you can use a page for each month of the next year to have a future-year planner. You can use these pages to track finances, plan birthday parties and holidays, list quick-reference information, or any way you want. I really like this update of the Brush Dance datebooks! Brush Dance products are available at www.brushdance.com. They have a great variety of themes for the datebooks, you are sure to find one (or several!) you love. 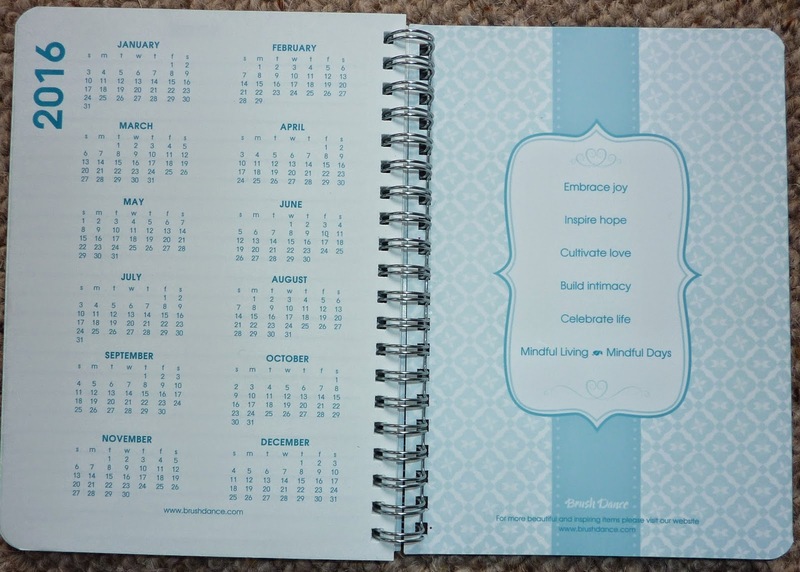 Many thanks to Brush Dance for sending me this beautiful datebook as a sample to review! The short answer is, everything. I'll tell you what, if I could go back in time and talk to my 20 year old self about my current planner use, I'm sure Past Me would think Current Me was a freak. 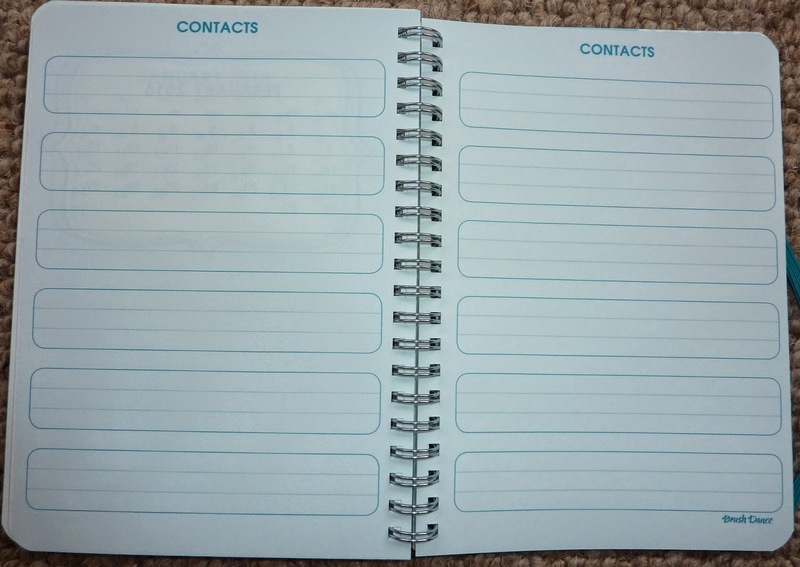 My life back then was just not complicated, and neither was my planner. But now with kids in activities, pets, a husband whose travel schedule changes all the time, and a home to maintain and run I need all the planner power I can get. So I'll tell you what I write in my planner. It looks like a lot, and it is, which is further proof of why my planner is so indispensable to me. You might not need to write all this. Or, you might need to write different things than what I write. 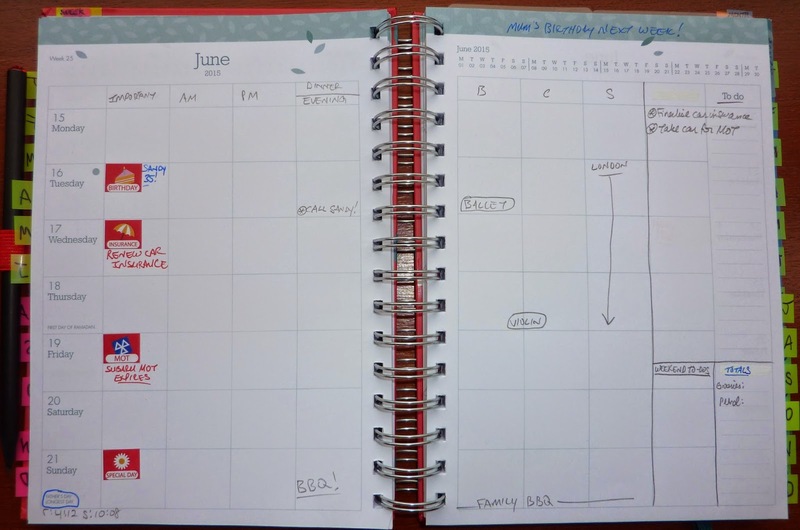 But hopefully this will give you some ideas on how to use your planner more effectively. Schedule and appointments. These are the very basics of planner use. Some people use their planner only for scheduled events, but for me it's only the beginning. Special dates and school holidays. Birthdays, anniversaries and holidays all get written into my planner before I start using it. I also write in school holidays and long weekends right away so we can schedule around those. If we are planning to travel or if we are having visitors stay with us, I write those dates in asap to avoid any clashes. Tasks, on the day or week they need done. I write tasks way in advance. For example, last year my Christmas shopping and preparations crept up on me and took me by surprise. So this year already in my weekly pages I have written reminders of when it's time to finalize gifts, reminders to buy wrapping and cards, and when to deliver gifts to people like my kids' teachers. On any given week, I have a list of things that MUST be done that week, and a list of lower-priority items. I also list my household cleaning tasks so I can check them off when they are done. Kids' and husband's schedules and events. My kids are in loads of activities, so I write them into my weekly pages so I can avoid double-booking (because despite the fact that I take my kids to them every week, I'm still likely to forget when put on the spot to schedule an event). Also my husband has an erratic and ever-changing travel schedule, so I capture those dates as soon as I know them. Deadlines and due dates, and reminders. I write in recurring deadlines and due dates as soon as I know them, on this year's planner and into my future year's planning pages so they don't get forgotten. I have loads of these and can't afford any of them to slip through the cracks. Some of these are annual and some are more frequent. I write reminders for these a few weeks before they are due so I can take the appropriate action. For example I make annual doctor's appointments before they are due in case it takes a couple of weeks to get an appointment time. Semi-annual like car tax and dentist appointments twice per year. Monthly: I still pay some bills by phone or online, so I write reminders each month on which days I have to pay the bills so I don't get charged late fees. Now we have a dog who needs wormer and flea control monthly, so I write those in too, otherwise I'm sure to forget! Other things need renewed farther in the future like passports, drivers licenses and vaccines, so I write all those in too because I absolutely can't afford to miss those. So you see, I use my planner at least as much for recurring and future events as I do for day to day planning. What do you write in your planner that's different from what I write? I just had to share my excitement! I finally ordered a Family Life Book from Organised Mum! Last year I decided too late I wanted one and they were already sold out, so this year I got one as soon as I could. I've used their Life Book diary several times, and it is great, but now my kids are older and each in activities, and my husband has an erratic travel schedule that's hard to keep track of so this year I went for the weekly grid format so I can see what each individual person is doing each day. The Family Life Book and Life Book diaries are 16 months, from mid-August (when school starts here in Scotland, THANK YOU OM!!) to the end of the following year. Some people complain about wasted months, but I absolutely need the planner this way and here's why: This time of year as the school year is ending (last day of school is today, hooray!!) I need to be able to plan into the next school year. For example, this week at my daughter's dance class the teacher told us the class will be at a new day and time in the autumn, and gave us the dates of the Christmas shows. With a 16 month planner I can write these dates directly into my diary without having to carry this and next school years' diaries around. Then when the new school year starts, I can transfer the dates over into the new diary and have the entire school year in one book. Brilliant. I like the design this year, it's pretty and soothing to look at. And the paper is spectacular, white and thick so there's no bleed through with my favorite pens. The Family Life Book's weekly grid has seven columns plus a column for meal planning, and space for To dos and Next Week. You can use these columns any way you like: one column for each family member; one page for you and the other page for your family; columns for home/ work/ volunteering, etc. I might have to experiment in pencil for awhile to decide how best to use these columns. Someone commented on Facebook that she doesn't like re-writing everyone's names at the tops of the columns every week. So I butted in (as I do) and commented that you could use the two clear acetate pagemarker sheets that come with the diary on each page of the weekly layout, use a wipe-off marker to write column headings and weekly recurring events, and you don't have to re-write anything, ever! Just move the clear sheets week to week. There are three weekly routines layouts, so you can write routines for school terms, work, household cleaning and maintenance, rotating meal planning ideas, on and on. 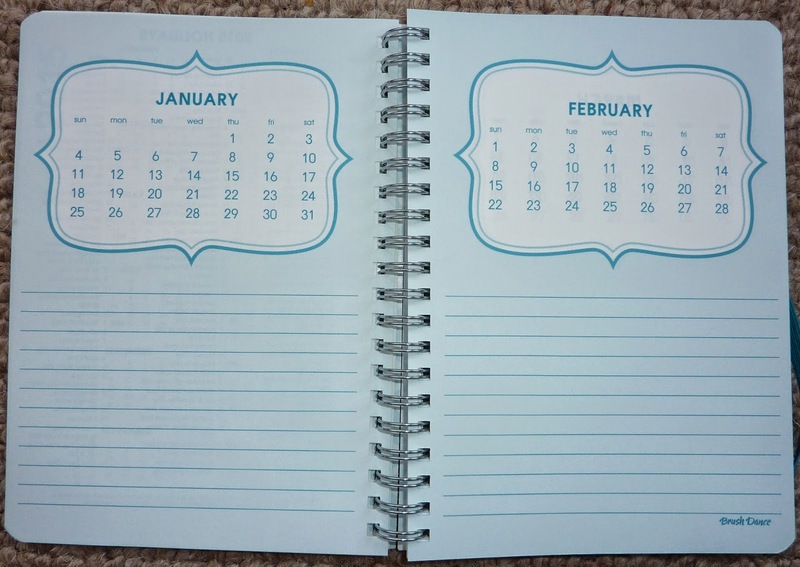 There is a section full of monthly planning including budgeting and tasks for each month (great for monthly reminders like checking smoke alarm batteries or seasonal household maintenance). There are monthly calendar pages, one page per month for August-December 2014 then the month over a two-page spread for January-December 2015. I won't show photos but there is an entire section for planning Christmas, holidays and summer. 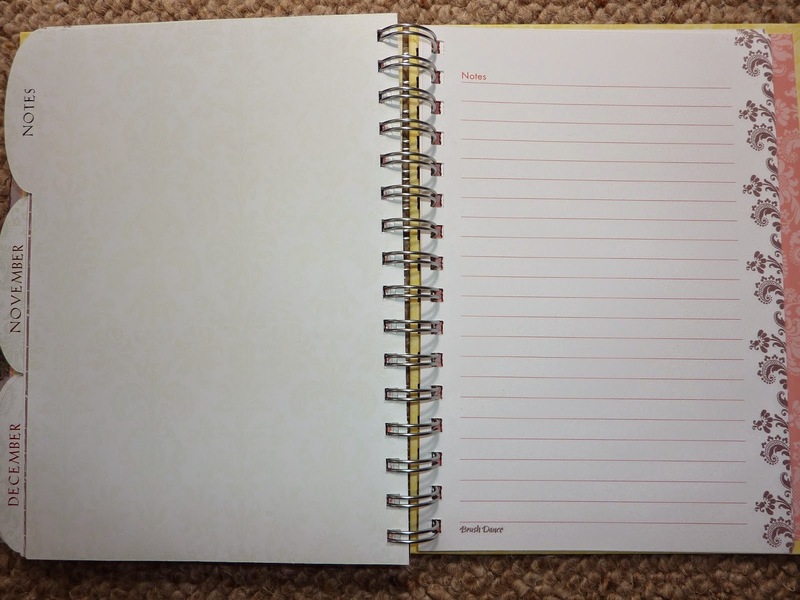 The Life Book diary has detachable shopping lists on the weekly pages. That doesn't work for the Family Life Book's weekly grid so instead there is an entire section of detachable shopping lists in the back of the book. I use sticky notes for my shopping lists, so I will use these pages (and there are a lot) for planning my children's birthday parties, permanent notes, and far-future planning and reminders. The Family Life Book also comes with an address booklet that you can use year after year, two pages of stickers (which you can see I have already used some of), and a pocket in the back to put papers, birthday party invitations, directions, tickets, and whatever else so those little bits don't get lost or buried at the bottom of your bag. The stickers are great for reminders of when your car's MOT is due, insurance renewals, doctor and dentist checkups, and to make special days stand out like birthdays and holidays. 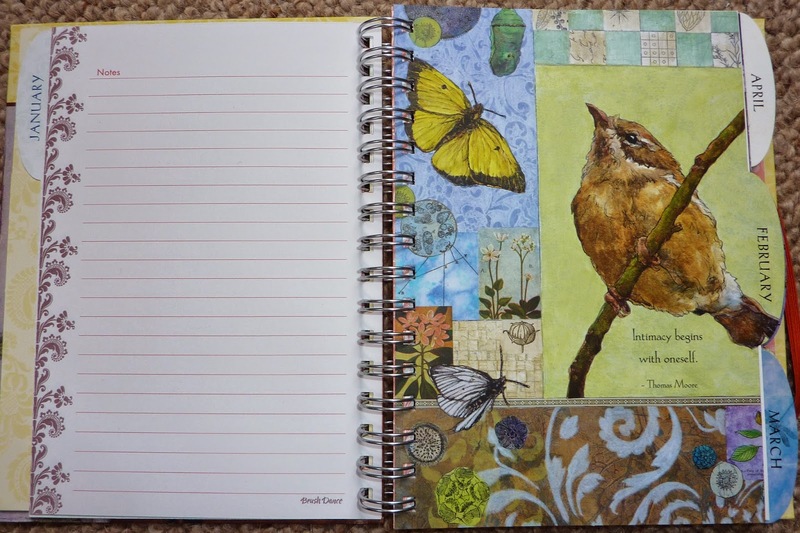 And they add color and jazz up your diary pages! I didn't take photos of the inside of the address booklet but it has pages for contacts, quick call lists, services, and birthdays reference to make it easier to add those dates to your diary each year. This year I treated myself to the crystal-topped pencil and stick-on loop (ordered together with my FLB, click here for link). I stuck it to the inside of the front cover so I can still slip my diary into the Organised Mum purple cover I bought a few years ago. I had been using the Organised Mum Pick And Mix inserts in my Filofax (click here to see my extensive post on how I've been using) but when this diary starts in August I will transfer to it, and keep it in my kitchen in the Organised Mum stand I bought a few years ago so the entire family can see it and write their own things into it. That way I am not the gateway to planning, everyone can contribute and see what is going on. Here is the front cover again, with the pencil and elastic strap! Track your schedules for home and work, and for each member of your family. Plan meals and write your shopping lists. Stick to your budget, track income and expenditures. Remember upcoming bills like insurance, car tax, MOT. Plan for Christmas ahead of time, make your budget for gifts and other holiday expenses. Plan the summer holidays, travel, camps and activities. Remember birthdays and anniversaries each year. Have contacts and important numbers easily accessible. Have a place to keep everything so nothing is forgotten! It seems to me that if you keep all of your and your family's weekly plans updated, fill in the budget sheets each month, use the stickers to remind yourself of when things are coming up, use all the sections of this diary, take this book with you everywhere, and look at it often, you can't not be organised! A common question from customers to Organised Mum is which should they choose, the Life Book diary or the Family Life Book diary? 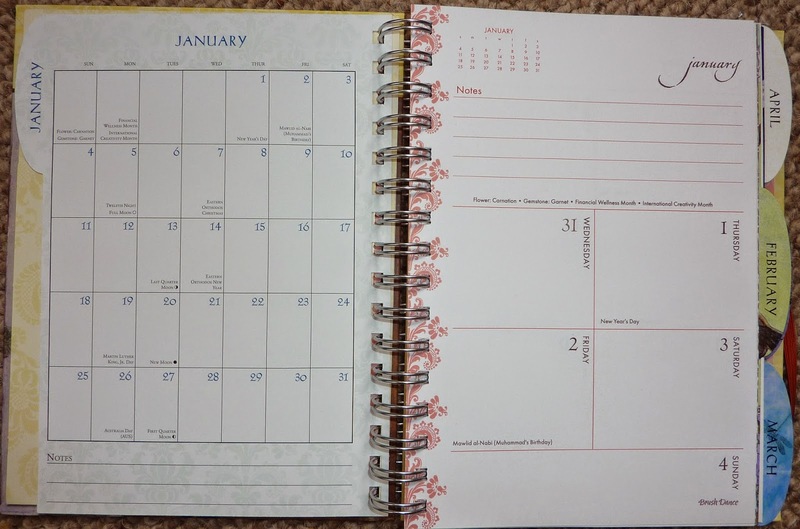 The Life Book has a traditional weekly layout (you can see this in my review of it here), and the Family Life Book has a weekly grid, otherwise the features of the books are the same. If your children are small and pretty much go everywhere with you, you probably would be best off with the Life Book. Similarly if your weekly schedule is mostly set and not complicated, the Life Book is probably best for you. The Family Life Book is probably best for you if you have to track different schedules each week, such as when your children are in after-school activities. The Family Life Book is also useful if you or your spouse/ partner travel often or work shifts, or otherwise have varying schedules. The grid makes it easy to see what each person is doing every day. **Edited because I meant to add: the Family Life Book and Life Book diaries have A5 size pages. They are easy to take out of the binding and punch to fit your A5 Filofax, Classic size Franklin Covey or Desk size Daytimer binder. I ordered this diary from www.organised-mum.co.uk. I have ordered from them several times over the years and they have excellent customer service. They ship internationally, I have ordered from them shipped to the US several times and have found their shipping prices to be very reasonable. I am not affiliated in any way, just a happy customer! I have added Weekend To-Dos, weekly expenses Totals (which I add up each week and put the totals into my monthly Budget pages), a larger area for To-Dos, and Next Week at the top of the right page. I LOVE the stickers! Also you can see how I've added month tabs to the weekly pages (yellow), months (blue), and monthly budget pages (green). I love how these weekly pages are so adaptable! New Brush Dance 2015 Weekly Planners! 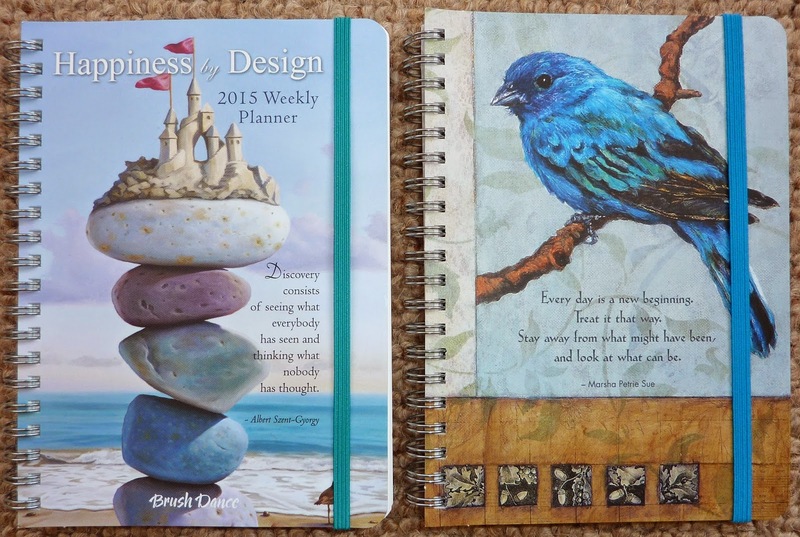 Brush Dance has brand-new weekly planners for 2015! They are gorgeous and super-portable! Huge thanks to Brush Dance for sending me these planners to review. 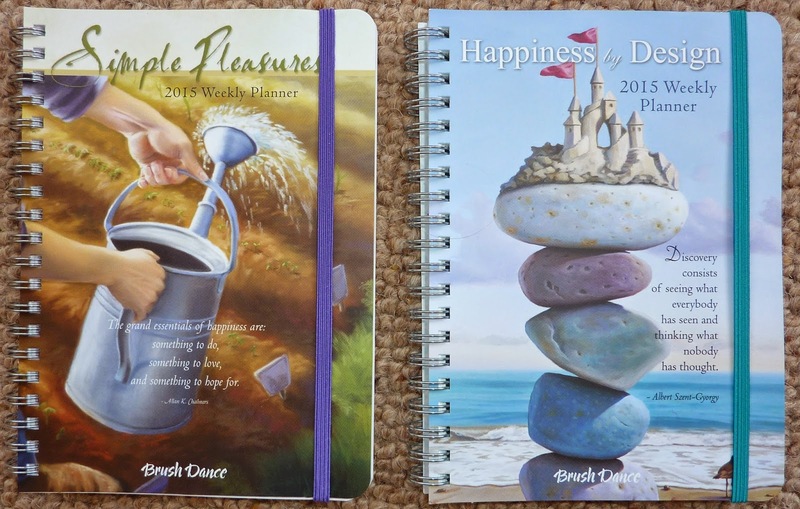 These are the Simple Pleasures and Happiness by Design weekly planners for 2015. The new weekly planners are slim and light, and measure 5 by 7 inches so they are easy to carry with you everywhere in your bag. The spiral binding lays totally flat or can even be folded back on itself, and an elastic closure keeps it shut in your bag. The planners have excellent 120 gsm paper for use with all your favorite pens, and loads of excellent features! 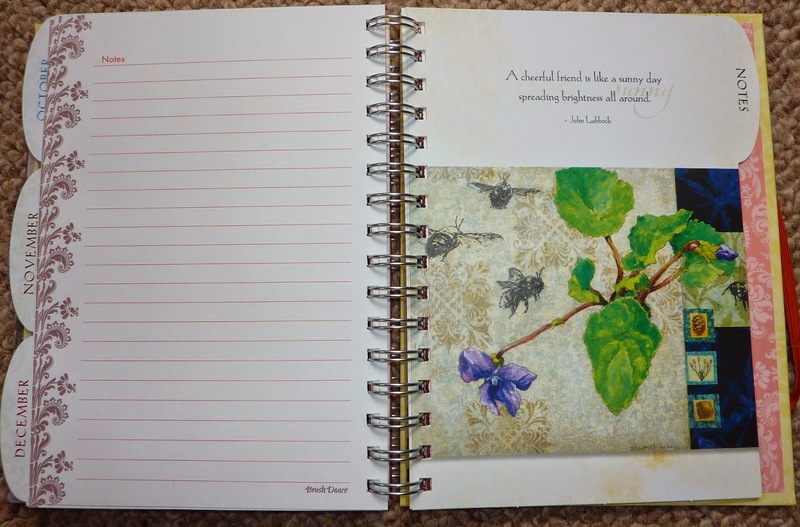 Below is a closeup of the beautiful art on the Simple Pleasures planner. There are loads of other beautiful cover designs for the 2015 weekly planners, click here to see them all. I'll take you for a walk through the planner to show you all the great features! First is a page to note your personal details (no photo). Then there is a quick-reference of 2015, and list of holidays. At the back of the book is a reference calendar for the following year. Here are the backs of the planners with more art. So pretty! These weekly planners are the same size and dimensions as the Brush Dance Dreamer Journals I reviewed (click here), so they would make perfect companions. To see the complete line of Brush Dance 2015 weekly planners click here, and to see all Brush Dance products click here. 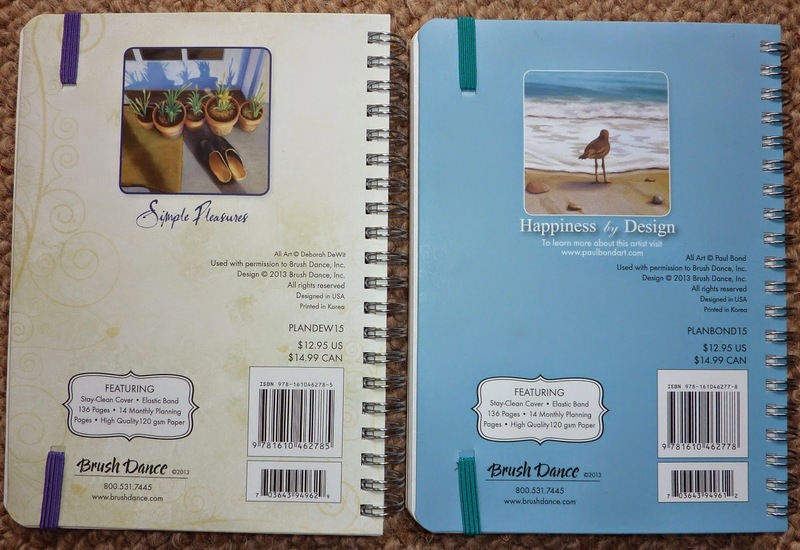 Many thanks again to Brush Dance for giving me the opportunity to review these beautiful and super-portable new planners!